Wood sanders are an invaluable tool used by woodworkers to alter the final finish and appearance of a woodwork project. There are, though, plenty of different ones to choose from and it can be tricky to know the benefits of using an orbital sander vs palm sander. In this article, we will be explaining what each one does and the best applications for them. During construction, wood is sawn and sliced and connected together, which often leaves it with a rough side that isn’t ideal for the final product. This is why sanders are used to smooth the surface and make it safe to touch. We simply wouldn’t be able to make things like tables from wood in the same without sanders, because they help create the final polished look that is desired. They can also be used for concrete. To do this job, there are lots of different types of sander that are available. The tool that you require will absolutely depend on the project and type of wood that you are working on, with some offering a high-powered grind, and other offering a lower powered more precise action. 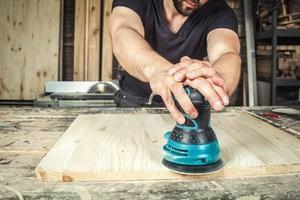 What is an Orbital Sander? An orbital sander is a handheld tool that spins the sanding disc in small circles, known as orbits. Quite often they will be square shaped to allow them to fit into corners and against edges. They aren’t too aggressive, which means that they can be used to work on delicate projects and remove small amounts of material. They also don’t leave too many marks so, as long as you are careful, won’t change the way the final piece looks. The marks are more pronounced than a random orbit sander, for example, which is another type of orbital sander that spins the pads in a random pattern to reduce this effect. Orbital sanders are the perfect tool to prepare a surface for being painted, or to remove paint before applying a new coat. The marks they leave mean that they are not what you want to use if you don’t intend on painting the wood and are looking for an uninterrupted finish. They are, of course, available in a range of different sizes, strengths and prices – each of which depend on the manufacturer and supplier. What is a Palm Sander? Palm sanders are the smallest model of sander that you can buy, so much so that they will comfortably fit within the palm of your hand. In comparison to other tools, they are very lightweight. They are also extremely easy to control when using them on wood, and usually are available at much lower prices than other types of sanders. Palm sanders are typically triangular shaped, so can easily fit into corners and edges, and are ideal for precision work on awkwardly shaped pieces. When using a palm sander, you don’t need to exert very much pressure on the tool. Instead, you should let it do all the work and let it glide across the surface. As with orbital sanders, there is a broad range of shapes and sizes available, so it’s worth looking at different manufacturers to ensure you get one that will be useful for your needs. So now we know what each type of sander does, the question remains on which jobs require which type of sander. We’ve already established that an orbital sander is a more heavy duty tool than a palm sander, so they are much more suited to work on large pieces, or where more material needs to be removed. They cover a much larger area than palm sanders so it can get the job done much quicker, but the finish won’t be as smooth and may have noticeable marks after the process. This means that for preparing surfaces to paint, or to remove paint, orbital sanders are by far the best tool to use. It will be done much quicker, and any marks will be covered over by the paint. If, however, you don’t intend to paint the wood, then the finish you achieve from a palm sander will look better. The smaller pads mean that you can focus more precisely on each area, and have far more control over how it ends up looking. It would be a waste of time and pads using a palm sander to remove paint or smooth down a large piece of wood that you want to paint, though, so it’s important you match the right tool to the job you are going to be doing. Sanding is one of the last stages in the process of building your creation from wood, but depending on the project you might need slightly different features from the tools. When choosing between an orbital sander vs palm sander, you must make sure you know the exact requirements of your project, whether you intend to paint it afterwards or if you’re looking for a smoother, less tarnished finish.